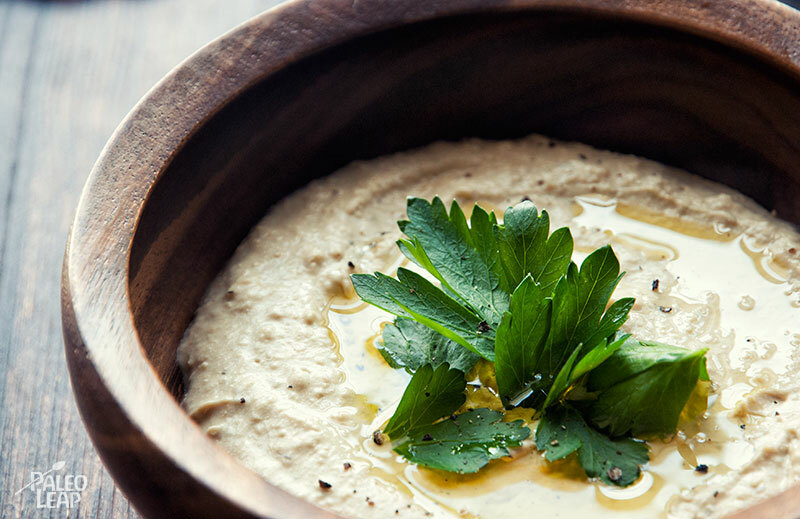 Baba-ghanoush is an Arabic dip similar to hummus. In differs in that it uses eggplants instead of chickpeas which makes it a great paleo alternative to hummus. A similar recipe, but for hummus, can also be prepared with cucumbers instead of eggplants or chickpeas. The basic ingredients used in traditional hummus are the same: lemon juice, garlic, olive oil, cumin and tahini. Tahini is a sesame paste made with ground sesame seeds and is available in most grocery stores, in the ethnic section. Since tahini is prepared with sesame seeds, it’s considered Paleo, but some people don’t do so well on high amounts nuts and seeds and try to limit them or completely eliminate them. Most seeds are also very high in Omega-6 fats. The amount of tahini used in this recipe is minimal, but you can decide not to use it and the end result will be just as delicious. Simply put a little more olive oil and lemon juice if you decide not to use any tahini. The traditional baba-ghanoush usually calls for roasted eggplants. The roasting of the eggplants gives a soft and smoky flavor to the eggplant flesh. You can play around with ingredients and add diced onions, tomatoes and olives to vary the recipe. You can also add chili powder for extra spiciness. Use it as a dip for vegetables, in salads, on cold leftover meat or simply as a side dish. Fresh parsley, optional, for garnishing. To roast the eggplants, either use your grill, the open flame of a gas stove or your oven. If using an open flame, keep the eggplant near the flame and turn them often to darken the skin evenly. If using your stove, prick the skin with a fork and roast for about 35 minutes in a 400 F oven. Put the roasted eggplants in a bowl of cold water, wait a bit and then peel off the skin. Place the roasted eggplant, garlic, lemon juice, tahini, olive oil, cumin in a blender and blend until smooth. Season to taste with salt and pepper. Cool in the refrigerator and serve with extra olive oil on top and fresh parsley.